Monday April 30th 1894 It was a sultry rainy day. Will did not feel well. I did the work and some knitting and putting bureau drawers to rights. Leonard cut wood and worked about the barns. I put some time at the piano. Tuesday May 1st 1894 It was still rainy this morning the boys were trying to fix fence. Will felt better. Late in the afternoon the wind blew very cold. I went down in the field before supper. I practiced some today. 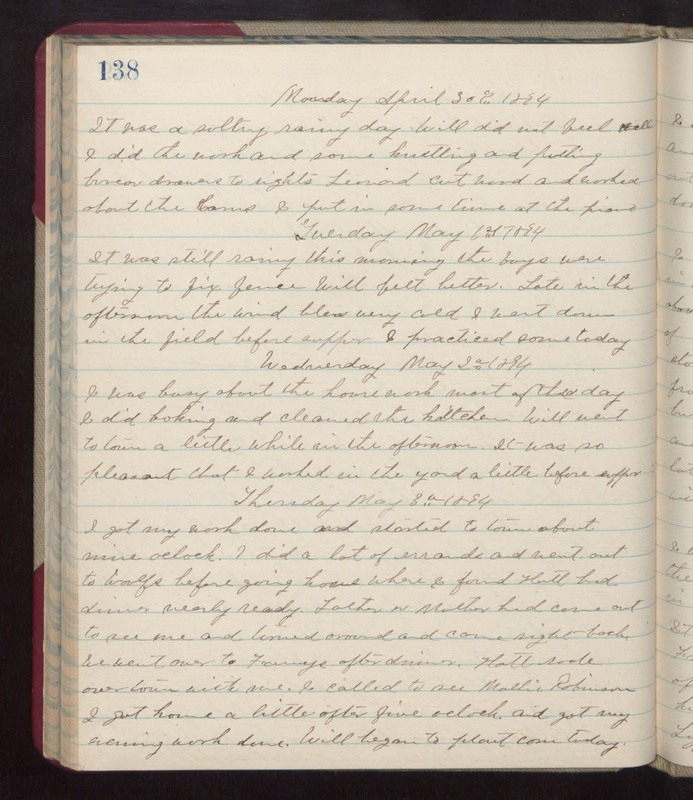 Wednesday May 2nd 1894 I was busy about the house work most of the day. I did baking and cleaned the kitchen. Will went to town a little while in the afternoon. It was so pleasant that I worked in the yard a little before supper. Thursday May 3rd 1894 I got my work done and started to town about nine oclock. I did a lot of errands and went out to Woolfs before going home where I found Hatt had dinner nearly ready. Father & Mother had come out to see me and turned around and come right back. We went over to Fannys after dinner. Hatt rode over town with me. I called to see Mollie Robinson. I got home a little after five oclock and got my evening work done. Will began to plant corn today.